The purpose of this voter guide is to educate voters impartially on a nonpartisan basis. 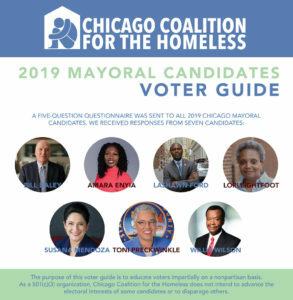 As a 501(c)(3) organization, Chicago Coalition for the Homeless does not intend to advance the electoral interests of some candidates or to disparage others. Over the course of a year, 80,000 Chicagoans experience homelessness. One in four of them is a child struggling to stay in school. Four out of five are African American or Latino. This number also includes people living “doubled-up” or staying temporarily with others because they lost their housing. If you become Mayor of Chicago, what would be your plan for addressing homelessness? Read answers here. “Street homelessness” can be defined as living on the street or another place not meant for human habitation. “Tent Cities” or “Encampments” have been a common symbol of people experiencing street homelessness throughout Chicago and other major cities. If elected, how would you address street homelessness? Read answers here. Different government agencies use different definitions of homelessness. The Department of Education includes households who are living temporarily with family or friends because they cannot afford their own place to stay, known as doubled-up, in addition to households staying on the street and in shelters. The HUD definition of homelessness only includes those living on the street and in shelters. What definition of homelessness would your administration utilize when distributing city-generated funds? Read answers here. CPS has identified 4% of its total enrollment as homeless, with almost 18,000 homeless and doubled-up students identified this school year. It’s common for students experiencing homelessness to encounter a multitude of barriers that prevent them from being able to obtain the same education as their peers. How would you help students experiencing homelessness? Read answers here. What would you do to increase preschool enrollment for homeless students? Read answers here.